After my unexpected visit to P@H last week I decided I really was ready for a new Russian ham, they didn't have any in until the next day & I didn't have a cage set up so the plan was to go & look for one today but after phoning both branches near me yesterday it turned out they still didn't have any, I was so disappointed & as a last resort phoned the shop where I got Flynt, I hate that place & never really wanted to go back there but having set my heart on a new ham I was getting desperate & it turned out they had two boys so I went to have a look this morning & found a lovely inquisitive little boy & was almost ready to bring him home, he was so sweet but then the girl was checking the other tanks to see if they had more reading the labels she said Chinese female! I nearly died of shock! They stopped selling Chinese about the time P@H did but have obviously changed policy although this little one had been there a while, she's about 12 weeks, so maybe they still don't sell too well & they may change their minds again. I really didn't think I was ready for a new chinesey girl yet as I'm in no way over losing my precious Whisp but seeing her there in a horribly noisy shop (loads & loads of very loud birds right next to the hams!) timidly hiding away in her cardboard tube my heart was completely & utterly stolen! I couldn't say no & sadly had to leave the little Russian guy behind, if only I'd had two cages ready it might well have been a different story! 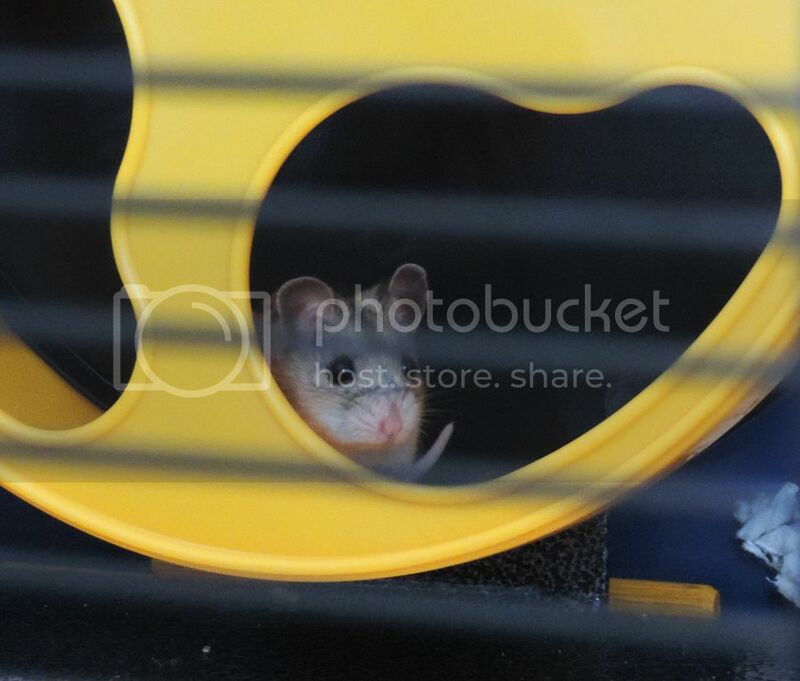 She did seem incredibly timid & I had to coax her out of the carrier into the tube from the shop which she now has in her cage & she just hid there for a little while but before long she totally surprised me & was up & about exploring her cage, found her wheel & had some fun trying to do a Zeki & empty her sand bath lol! I had to make a few rapid changes to the cage when I got her home as a Russian set up doesn't suit a Chinese so it's a bit of a shambles at the moment, she's been wreaking havoc & burrowing like crazy already so I'll wait for her to make herself at home before I make any changes to it. I think some hammocks may be coming out of storage before long though. She's sleeping off all the excitement now but this was within her first half hour home! She was very nearly called Karma on the way home, it just felt right but doesn't really roll off the tongue & sitting there watching her & talking to her I thought "Everything Zen? I think so" A bit of a variation on the song for anyone old enough that goes "Everything zen, I don't think so" which is very much the way things had been until today! Congratulations on Zen, she is absolutely adorable, and she looked like she was enjoying her new wheel. She is such a lucky hamster to come home with you. Looking forward to hearing more about Zen as she settle in. Oh she's adorable and she'll be in line for a lovely home with you. If she's twelve weeks old, she'll be a similar age to my Victoria. There's always that moment when we'll come home with an unexpected new arrival but it's always nice when you see them and know that you just need to bring them home. I'll look forward to reading more about her. Oh wow she is gorgeous!! I had a Chinese girl once, I love the way they curl their tail round your finger and just cling to you. Zen looks like she has already settled in bless her. Oh what a sweet little face! Aaw so cute chinese hamsters are so sweet looking. More like mouse hamsters I think congrats! Momma to Archie, the Winter White Russian Dwarf Hamster, and many, many mice. Oh oh! She is beautiful. Look at those big ears up and those lovely eyes! Stunning! Lucky little girl to be found by you. Poor little Russian boy- never mind, you can always go back! She is stunning! An absolute beautiful. Such a lucky girl to be with such a good ma!